Jasmine Fairy Flower Fairies inspired by Cicely Mary Barker's drawings. 2 inch Polka Dot Plant (Hypoestes phyllostachya Splash Combo Rose Rose) leaves of white with green and pink with green, high light indoors. This fairy garden is planted with indoor plants. Yeah! 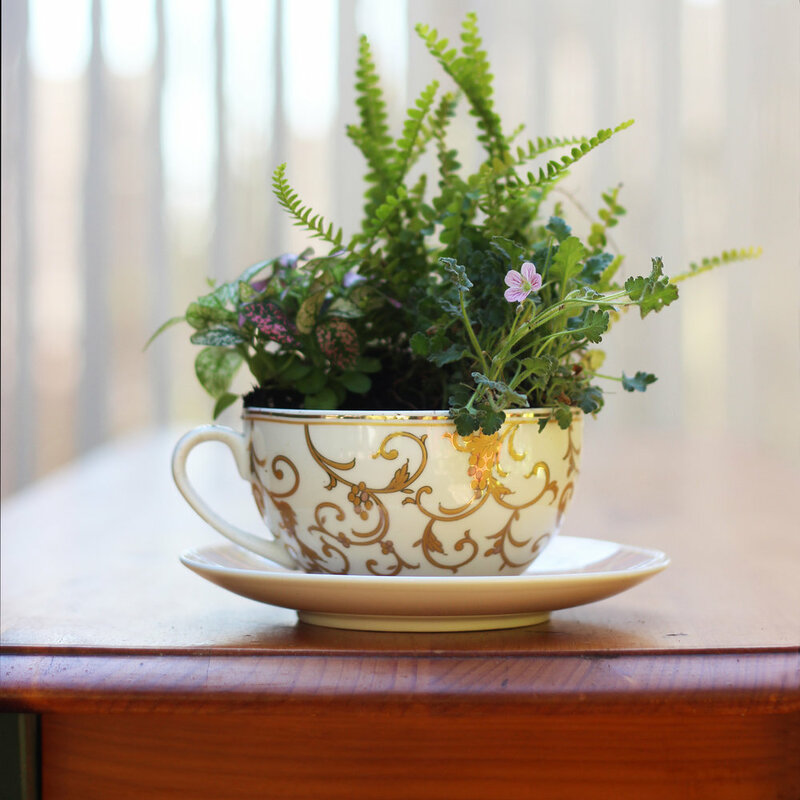 You will need to put your teacup garden in indirect light. You don't want to burn it up in a South facing garden window. Fairies are sensitive and sunburn easily. This teacup is graced with the neoclassical Jasmine Fairy, hand painted with delicate features, she looks almost real sitting in this fairy garden, hanging her feet over the edge. Make sure to secure her in place with a little floral clay pressed into the seat of the chair. Likewise, use a small piece of clay to secure each piece of the tea set. Place a handful of gravel in the bottom of the teacup for drainage. An alternative to this for drainage would be to drill a half inch hole with a diamond bit, starting to drill at a 45% angle with water on the surface of the bottom of the teacup. But gravel will do fine if you don't over water. The wild little delicate fern in the back is Lemon Button Fern and is an Evergreen. It is the tiniest of Boston Ferns and if you crush one of its leaves it has a lemon scent. 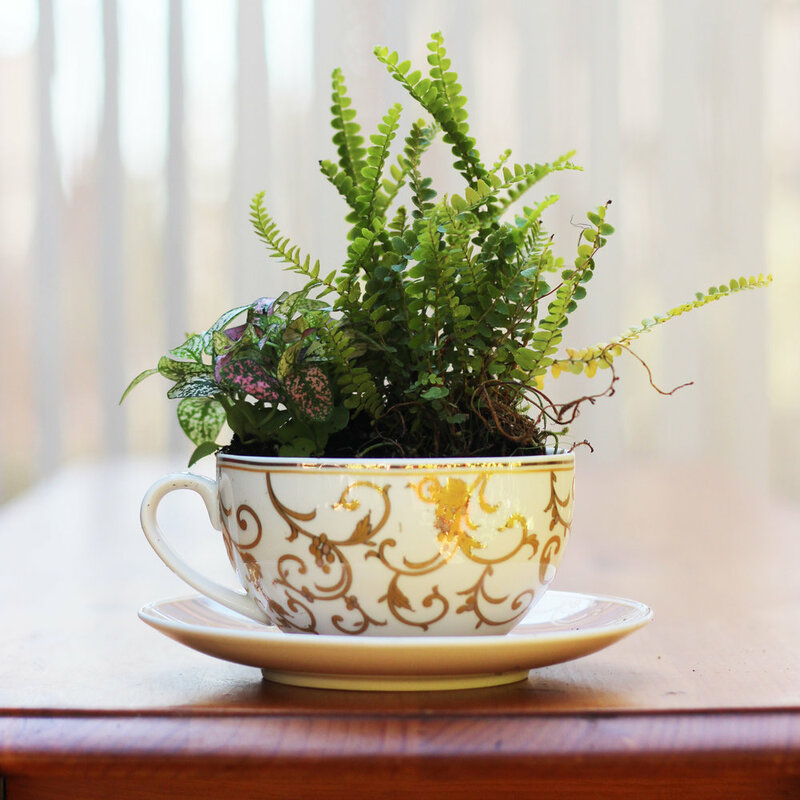 If you have found your fairy, tea set, teacup, and tiny plants, its time for tea. Put a handful of gravel in the cup or drill a 1/2 hole in the bottom of it with a diamond bit. Put a little potting soil on top of the gravel, like so. Plant Lemon Button Fern in back right of the cup. Plant Polka Dot Plant in back left of the cup. Plant Heron's Bill in the front right of the cup. Plant Baby Tears in front left and center of the cup. Use needle nose pliers to take rings of tea set. Put a little clay on bottom of tea set and press onto table. Place the table, chair and garden globe. Tuck a few pinches of moss around the back of the Lemon Fern and Polka Dot Plant. Place clay under fairy and push onto the seat of the chair so she won't fall. The fairies are delicate and can break. The Jasmine Fairy seems so perfect. Her legs swing off the chair. Her feet dangle in the Baby Tears ground cover, and you can even see the tiny bow on her spoon. Her gaze is fixed on the garden globe and her wings dip down behind her. A ray of light catches the curls in her strawberry blond hair, illuminates her wings and shimmers across the gold leaf on the cup. The light draws our attention to the delicate features of the Jasmine Fairy whom it seams is seated at a tea party in a fern graced wood. Enjoy this tiny fairy and her garden.